Mainstream media and political analysts seem obsessed covering the eccentricities and peculiarities of the occupant of the White House, adventuring how Trump’s limitations as a statesman may have undesired impacts on executive governance. Trump’s unpredictable behavior and decision-making style have stunned many observers, but both recent and historical presidents of the Americas also had flamboyant personalities (and performances). Idiosyncratic presidents, in fact, have always existed. Not so long ago, Presidents Hugo Chávez of Venezuela (1999-2013) and Abdalá Bucaram of Ecuador (1996-1997) used to hit international headlines for their extravagances. Bucaram, popularly nicknamed “El Loco,” was eventually impeached by Congress for – officially – being a madman. What these eccentric characters remind us is that those who hold the most important political offices in their countries bring their unique personalities to power with them, and such uniqueness has an impact on their performance. However, students of the presidency have generally failed to quantitatively measure how the personality traits of the leaders may impact executive governance. Arguably, this failure occurs mainly because students of the presidency have failed to absorb research on differential psychology. This brand of psychological research studies the individual differences of humans, or how people differ from each other in how they feel, act, think and behave. Absorbing the theoretical, empirical, and methodological contributions of the differential psychology literature would also allow integrating the research of scholars who focus on the “personal” presidency and those who center on the “institutional” presidency. Both research streams have run through parallel corridors, leading to conflicting views on how the presidency works. The president-centered (also called “personality-centered”) approach examines decision making in the executive branch based on presidential behavior. Scholars from this group examine the ability of presidents to persuade individuals and organizations to accommodate policy making to their preferences. They argue that the heads of government have plenty of room to act and decide at their own discretion. Since the individual attributes of the leaders influence policy outcomes, it is necessary to analyze the personal characteristics of the leaders to understand executive politics (Neustadt 1960; Barber 1972; Greenstein 2009). In contrast, presidency-centered (also called “institutional presidency”) studies minimize the importance of presidents as individuals and center the explanation of policy outcomes on the institutional setting in which heads of government work (e.g., Moe 1993; Dickinson 2004; Lewis 2008). The central assumption in this approach is that different presidents will behave similarly in identical contexts. It regards the study of the characteristics of the leaders as unworthy because more explanatory leverage is -supposedly- gained when scholars analyze the effect of institutional factors on policy outcomes. The opposing theoretical views have contributed to a divide of students of the presidency along two methodological lines with little interconnection. While presidency-centered researchers mainly conduct statistical or game-theoretic analyses, most president-centered studies are qualitative. I argue that the division wall between presidency-centered and president-centered explanations of the presidency is built on unsound foundations. Presidency-centered scholars have assumed that the personal characteristics of presidents 1) are of little relevance to understand their behavior and that 2) such features cannot be systematically measured because they are idiosyncratic. Although president-centered researchers do not share these assumptions, they have also failed to recognize that 1) on differential psychology there is a broad consensus on what human personality is, and that 2) personalities tend to be stable over time. These misconceptions have had profound consequences. Presidency-centered researchers claim that presidents cannot be used as units of analysis in quantitative studies (e.g., King 1993) and that analytically little is lost leaving the uniqueness of the heads of government aside. However, a vast corpus of psychological research contradicts the assumption that the specificity of presidents is irrelevant to understand their behavior. The literature on differential psychology has shown that all individuals have stable personality differences and that these differences strongly explain their behavior (Judge et al. 1999; Goldberg 1990; McCrae and Costa 1997; Costa and McCrae 1992). Since personality traits are stable, they can be systematically studied. Presidents can be treated as units of analysis in statistical analyses. Although president-centered scholars recognize the importance of the personal characteristics of the presidents, they have often discussed psychological attributes of the leaders arbitrarily, paying little attention to psychological research (e.g., Greenstein 2009). I propose that to have a deeper understanding of the presidency, we need to start testing hypotheses that include presidency-centered and president-centered paradigms. 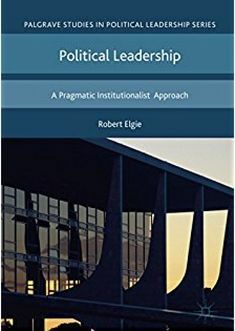 To do so, it is necessary to reposition the individual differences of leaders as a central cause of political phenomena in quantitative research. And we cannot do that unless we absorb the knowledge produced from the discipline that has studied how humans differ from each for the last 130 years. Barber, James D. 1972. The Presidential Character: Predicting Performance in the White House. Englewood Cliffs, NJ: Prentice-Hall. Costa, Paul T. Jr., and Robert R. McCrae. 1992. “Normal personality assessment in clinical practice: The NEO Personality Inventory.” Psychological assessment 4(1): 5-13. Dickinson, Matthew J. 2004. “Agendas, agencies and unilateral action: new insights on presidential power?” In Congress & the Presidency: A Journal of Capital Studies 31(1):99-109. Goldberg, Lewis R. 1990. “An Alternative ‘Description of Personality’: The Big Five Factor Structure.” Journal of Personality and Social Psychology 59(6): 1216-1229. Greenstein, Fred I. 2009. Inventing the job of president: leadership style from George Washington to Andrew Jackson. Princeton, NJ: Princeton University Press. Judge, Timothy A., Chad A. Higgins, Carl J. Thoresen, and Murray R. Barrick. 1999. “The Big Five Personality Traits, General Mental Ability, and Career Success across the Life Span.” Personnel Psychology 52: 621–652. King, Gary. 1993. “The Methodology of Presidential Research,” in George Edwards, III, John H. Kessel, and Bert A. Rockman, eds., Researching the Presidency: Vital Questions, New Approaches. Pittsburgh: University of Pittsburgh: 387–412. Lewis, David E. 2008. The politics of presidential appointments: Political control and bureaucratic performance. Princeton: Princeton University Press. McCrae Robert R., Paul T. Costa Jr. 1997. “Personality Trait Structure as a Human Universal.” American Psychologist 52(5): 509-516. Moe, Terry M. 1993. “Presidents, Institutions, and Theory.” In George C. Edwards III, John H. Kessel and Bert A. Rockman, eds., Researching the Presidency: Vital Questions, New Approaches. Pittsburgh: University of Pittsburgh Press. Neustadt, Richard. 1960. Presidential Power: The Politics of Leadership. New York: Wiley and Sons. This entry was posted in Comparative politics, Presidentialism and tagged Political psychology, Presidency, presidents on March 27, 2018 by Robert Elgie. This is a guest post by Sarah Shair-Rosenfield and Alissandra T. Stoyan. It is based on their paper in Political Research Quarterly. Over the last two decades democracies worldwide have elected record-setting numbers of women presidents – in Argentina, Brazil, Chile, Costa Rica, Liberia, Philippines, South Korean, and Taiwan to name just a few. One of the most frequently touted benefits of electing women to any office is the expectation that they tend to rely on or prefer a model of leadership based on negotiation and consensus-building. Indeed, that very quality is often highlighted by journalism about women’s political successes or sometimes promoted by women themselves. Portrayals like this are typically built on the actions and behaviors of women legislators, or the behavior of legislatures with substantial proportions of female members. Legislatures may lend themselves to studies of gender and leadership styles or preferences because there are relatively more women legislators to evaluate. Legislatures also vary in the size of their female contingents, so it is possible to compare outcomes across different levels of female representation. Perhaps most importantly, it is also easier to understand why negotiation and consensus might be useful for governance: legislatures are themselves collective bodies that must form at least a majority to accomplish most tasks. Conversely, it has been difficult for political scientists to study how leadership styles might translate to governance strategies of presidents. Although women presidents are more common today, they are still relatively rare. Furthermore, presidents may need to work with legislative counterparts to affect the policy agenda, but they also often have a range of unilateral powers at their disposal. This may reduce their reliance on or preference for negotiation and consensus. How might we expect the assumptions about women’s leadership styles to shape women’s use of their unilateral presidential powers, such as the ability to issue executive decrees? In our new work, we use a paired-comparative approach to evaluate rates of executive decree issuance in Argentina, Brazil, Chile, and Costa Rica between 2000 and 2014. In each case, a woman president succeeded a man from the same political party. The advantage of this research design is that each pair of presidents faced the same institutional constraints, the same or highly similar partisan opponents, and the same or similar own-party policy preferences. This means we can eliminate a host of alternative factors that might explain variation in decree issuance. Instead, we are able to narrow our focus to the effect of gender on a president’s tendency to make use of her or his unilateral decree power. We find that gender by itself matters somewhat to rates of decree issuance; women do appear less likely to rule by decree overall. Cristina Fernández de Kirchner (Argentina) and Laura Chinchilla (Costa Rica) are much less likely to use such power compared to their predecessors, while Michelle Bachelet (Chile) is slightly less likely to do so and Dilma Rousseff (Brazil) issues decrees at higher rates than her predecessor. Collectively this provides some evidence that there is a gender-based difference in the use of this type of presidential authority. However, a more nuanced look at when and why presidents wield such power reveals additional information about the gender-based difference. Presidents are presumed to have the option of “going public” in order to influence the policy agenda. For example, a president may consider that high public approval ratings indicate a public mandate or support for action. Rather than trying to bargain or work with congress to pass legislation, a popular president may feel confident in issuing more decrees to accomplish her or his policy goals. A president motivated to work collaboratively or build consensus should be less interested in this “go public” option, and should rely on it less frequently. When we account for a president’s approval rating, we see very different trends emerge in the decree issuance of women and men presidents. This figure shows that the (relatively low) rate at which women issue decrees is largely unaffected by how popular they are with the public. In contrast, men become much more likely to issue decrees as they get more popular. The gap in decree issuance by women and men is widest and most consistent with high levels of approval, but this gap narrows as presidents face declining approval that prevents them from being able to assert their will. Scholars have often assumed that Latin American presidents are prone to abusing their unilateral authority, especially when they are or become more popular. At higher levels of popularity, presidents might be emboldened to “go public” with their policy preferences, rather than wasting their time and resources negotiating with the legislature. What we find suggests that this assumption may be true for Latin America’s presidentes in general, but that its presidentas tend to be less abusive of their authority even when they are popular enough to potentially do so. As more women run for high office around the world, it seems important to consider this evidence of gendered differences in leadership that point to a new model of presidential self-restraint. Further analysis could illuminate distinctions in women’s motivations for governing as they do, in terms of both their strategic motivations and also the substance of the policies they may pursue. This entry was posted in Argentina, Brazil, Chile, Costa Rica, Latin America and tagged gender, Latin America, presidents, Women presidents on February 13, 2018 by Robert Elgie. This is a guest post by Jessica Fortin-Rittberger, Professor of Comparative Politics at the University of Salzburg. It is based on a chapter entitled “Strong Presidents for Weak States. How Weak State Capacity fosters Vertically Concentrated Executives” in Philipp Harfst, Ina Kubbe, Thomas Poguntke (eds.) Parties, Governments and Elites: The Comparative Study of Democracy, Springer series in comparative politics. The link between institutions and democratic survival is at the heart of a vibrant scholarly exchange, debating the virtues and perils of parliamentary and presidential systems. Presidentialism in Latin America, but also in former Soviet republics, correlates strongly with authoritarianism. But what if this correlation is an artefact? What if it is rooted in a constellation of conditions that predate the choice of institutions? In other words, are presidential institutions shallow causes of democratic consolidation? In a newly published paper, I argue that the conditions under which different types of executives are chosen following regime transitions are indeed a key to the puzzle. I propose an explanation that suggests that the intrinsic features of presidential systems are less relevant than the conditions that facilitate the installation of vertically-concentrated executive power. I focus on a specific form of context: infrastructural state capacity understood as “the institutional capacity of a central state, despotic or not, to penetrate its territories and logistically implement decisions” (Mann 1993: 59). Many of the new states that were born after the 18th century, and especially after World War II, were not consolidated and suffered from limited infrastructural capacity. Interestingly, many of these new states also emerged with vertically-concentrated presidential arrangements: I do not think this is a coincidence. In situations where infrastructural state capacity is most deficient, the vertical concentration of executive power in the hands of a few players becomes more likely. To look into this relationship, I examined 26 post-communist countries over the period between 1989 and 2009. This set of countries is an ideal testing ground to probe this relationship, since the environment of state capacity is temporally prior to the selection of institutions. Most new constitutions were established in a time period ranging from a few months (Hungary) to up to five years (Ukraine) after the collapse of communism. To capture the level of power concentration in the hands of the executive, I employed two indicators. Table 1 presents the scores of both indicators in the year of the first post-communist constitution. The first encapsulates the formal level of power concentration from Frye, Hellman and Tucker’s Data Base on Political Institutions in the Post-Communist World (2000). In this measurement, powers of popularly elected presidents are scored from (1) to (21), where (1) represents the weakest presidents in terms of constitutional provisions, and (21) the presidents endowed with the most prerogatives. The second indicator taps into informal practices. I used the item called “constraints on chief executive” from the Polity IV dataset (Marshall and Jaggers, 2012). This measures the operational (de facto) independence of the chief executive in relations to other players. The categories range from (1) where the chief executive has unlimited authority, through (7) where the chief executive is at parity or subordination to other institutional players (legislative assembly, prime minister, constitutional court). Harnessing both formal and informal aspects of executive power allows me to grasp the phenomenon of power concentration in an encompassing fashion. The analyses provide unambiguous support for my core argument that state capacity is crucial to establish executive dominance over other institutional players. State capacity at the onset of independence (or transition) helps to explain the level of executive power concentration in the newly designed constitutions. This means that in environments with weak infrastructural state capacity it is easier for politicians aiming to secure state power or to access to the state’s power resources to push for the adoption of strong, vertical forms of executive power. Once in place, these power structures have proven quite durable, although some countries have recently enacted reforms to curb executive power, at least on paper. This also helps explain why the record of presidentialism has been so dire in the region; it is not the institution of a president per se that is harmful to democracy, rather the extent to which power is concentrated. Even though I find these strong relationships in my research, there are some important caveats. Many of these institutional setups are static over time, hence my models face difficulties to explain recent occurrences of executive power concentration that were accompanied with democratic backsliding. Turkey is a case in point, where we can observe the demise of a democracy in a brazen power grab at the hands of a leader seeking to establish a presidential vertical. Yet, the state was not weak at that point. Hungary is another example, with the authoritarian tendencies of its government, and Prime Minister, to curtail political rights and freedoms, as well as dilute institutional checks and balances. Hungary is particularly problematic for my argument, since it should have been a least likely candidate for such a reversal. A strong state is therefore no guarantee against executives engaging in power grabs; a weak state simply makes it easier. Frye, T., Hellmann, J. S. & Tucker, J. 2000. Data Base on Political Institutions in the Post-Communist World, unpublished, Columbia University. Mann, M. 1993. The Sources of Social Power, Vol. 2: The Rise of Classes and Nation States, 1760-1914, New York, NY: Cambridge University Press. This entry was posted in Central Asia, Comparative politics, Europe and tagged Presidential Power, presidents on July 3, 2017 by Robert Elgie. This is a guest post by Aníbal Pérez-Liñán of the Department of Political Science at the University of Pittsburgh and John Polga-Hecimovich of the Political Science Department at the US Naval Academy at Annapolis. It is based on their paper in Democratization. Are presidential impeachments modern functional equivalents of old-fashioned military coups? The impeachment of Brazilian President Dilma Rousseff in August 2016 led to an acrimonious debate on whether her removal from office constituted a “soft coup” against an elected leader. Similar concerns were voiced after the impeachment of Paraguayan President Fernando Lugo in 2012. As calls to impeach President Donald Trump multiply, this question appears to gain increasing relevance for US politics as well. For students of presidentialism, the idea of “functional equivalence” between military coups and legal ousters (impeachments, legislative declarations of presidential incapacity, or anticipated resignations of the executive) translates into very specific questions: Are there any historical factors able to explain military coups as well as impeachments? If so, why are some presidents removed following legal procedures while others are removed by force? In a forthcoming paper in Democratization we develop a unified theory of presidential instability to explain why presidents are removed from office through military coups or through legal procedures. We identify two sets of historical causes. First, some factors create conditions for presidential instability, irrespective of the mode of premature exit from office. Because they motivate a political opposition to conspire against the government, those factors explain why presidents are likely to fail, but not how they fail. Second, an alternative set of causes accounts for the specific institutional manifestations of presidential instability. Those factors map onto the relative capabilities of groups inclined to pursue a military coup or the legal removal of the president. The distinction between general motivations to remove the president and the capabilities of specific opposition groups helps us identify the role of different causal explanations in the literature. Poor economic conditions. Recessions undermine the president and facilitate conspiracies. Studies on military coups argue that negative economic shocks increase the risk of military rebellions, while the literature on impeachments shows that weak economies undermined Latin American presidents in the 1990s. Popular protests. Mass mobilization against the government signals that the president is weak and destabilizes any elected administration. Students of military intervention find that mass protests help elites coordinate in a coup. Students of impeachment emphasize that protests encourage reluctant legislators to act against the president. Radicalization. Radical actors have intense and extreme preferences; they are reluctant to bargain and remain intransigent in defense of their policy goals. Radicalism is therefore a potential cause of military coups, but also an explanation for the role of social movements forcing the resignation of presidents in places like Bolivia and Ecuador. The regional context. A long line of research has invoked international diffusion as an explanation for democratic instability – though not necessarily government instability. The regional context may strengthen the position of coup perpetrators or otherwise direct elites towards legal strategies against the president. Legislative support for the president. Two causal mechanisms are discussed in the literature: Linz’s argument that presidentialism itself is a source of instability and the argument that a legislative majority “shields” the executive against impeachment. Elite support for democracy. A strong normative preference for democracy among elites forecloses the possibility of a military coup and leaves legal removal as the only acceptable strategy for the opposition. The government’s normative preferences also matter: a president dismissive of democratic rules may be unwilling to recognize the legitimacy of an impeachment procedure, driving opponents to consider the option of a coup. To test those expectations, we use discrete-time event history models with selection. Our sample covers all democratic regimes in nineteen Latin American countries between 1945 and 2010 (N = 729). The dependent variable measures yearly outcomes for each president: survival, exit via military coup, or exit via legal removal. Our sample includes 21 coups and 15 legal removals. The selection model estimates the risk of president being removed from office (in any way) in the selection stage, and the risk of being removed via coup (as opposed to a legal procedure) in the outcome stage. The statistical models allow us to estimate the risk of coups and impeachments, plotted in Figures 1 and 2. Figure 1 underscores the role of common motivations behind coups (in the bottom row) and impeachments (in the top row), as economic recession, demonstrations, and radicalization consistently expand the risk of both outcomes. Figure 2, on the other hand, illustrates the differential impact of variables. The first column illustrates how a large number of coups in neighboring countries expands the risk of military intervention but reduces the probability of legal removal in the observed country. The second column shows that the risk of military overthrow remains independent from the composition of congress, but impeachment is less likely when the executive controls the legislature. The third column shows that a military coup is unlikely when political actors are more committed to democracy. By contrast, the risk of legal removal expands as groups operating within the constitution become empowered by the opposition’s reluctance to engage in military conspiracies. Our findings underscore that common causes of presidential instability are not necessarily causes of democratic breakdown, yet crises of government may easily escalate into crises of the democratic regime when legal venues for the removal of the president are blocked. These findings are increasingly relevant today. In a global context in which presidents and their adversaries – in Latin America, Eastern Europe, Turkey, and even the U.S. – have displayed growing levels of radicalism, our findings raise concerns. Radical leaders engender polarization, encouraging their opponents to overthrow the government by any means possible. Combined with economic stagnation or social protest, radicalization is likely to trigger presidential instability. Yet other factors ultimately tip a crisis towards a non-democratic resolution. A regional environment hostile to democracy and a lack of democratic commitment from domestic elites decrease the probability of a legal impeachment and increase the likelihood of a coup. International policymakers would be wise to consider these findings: long-term efforts to build regional organizations that discourage military intervention and steady support for democratic leaders will prevent future presidential crises from escalating into full crises of democracy. This entry was posted in Latin America and tagged coups, Impeachment, Latin America, presidents on June 14, 2017 by Robert Elgie. Within the last decade, many industrial countries have experienced three crises: a financial crisis, an economic crisis in the form of a major recession, and a sovereign debt crisis. Some observers even believe that the still ongoing sovereign debt crisis in Europe endangers the survival of the euro area and seriously undermines European integration. Although financial and economic crises contributed to the poor state of public finances, in many countries, public finances were stretched to the breaking point even before the outbreak of the crisis. Thus, they were unable to bail out financial institutions and stabilise the business cycle without significantly raising investors’ concern over the possibility of substantial default risk. Although many major economic reforms appear to be unthinkable without the commitment of political leaders and, consequently, are strongly associated with their names (consider, for instance, US President Roosevelt’s New Deal as well as the supply-side oriented economic policies initiated by US President Reagan referred to as Reagonomics or, more recently, Japan’s Prime Minister Shinzo Abe’s macroeoconomic experiment, often called Abenomics), the economics literature has rather neglected the role of heads of governments for countries’ economic and fiscal performances. In an article recently published in Economics & Politics, we aim at shedding some light on this issue. Utilising data on 21 OECD countries over the period 1980‒2008, we empirically investigate whether there is a systematic link between the socioeconomic backgrounds of those countries’ presidents and prime ministers and their fiscal policy stance. Our main interest lies in the association between political leaders’ socioeconomic status before taking up politics–that is, their relative standing in society as indicated by the level of formal education, income, and social capital–and the fiscal deficits during their incumbencies. Our findings reveal that heads of governments from lower socioeconomic backgrounds are more likely to run larger budget deficits than leaders who were affiliated with the upper class before their political career. This difference appears to be of notable size: the tenures of lower-status leaders are associated with a deficit-to-GDP ratio which is roughly 1.6 percentage points higher than that of high-status leaders. Over time, this effect increases to almost 12 percentage points. Moreover, we find that in political systems characterised by stronger constraints on policy-makers in the form of checks and balances or government fractionalisation, the impact of political leaders’ socioeconomic status on fiscal deficit declines. However, it continues to be statistically significant and economically relevant. The argument we offer to explain the relationship between political leaders’ socioeconomic background and fiscal deficit builds on a long tradition of social science research. According to sociology, a person’s thinking and acting is steered by a system of lasting, transposable dispositions, also called habitus. These dispositions are a reflection of the social experiences a person gathers and the life conditions she is exposed to and become manifest in particular patterns of appraisal and practice. In status-conscious societies, status discrepancies serve as the foundation for social categorisation, as they provide an effective tool for labelling people. Depending on their status, individuals are assigned to classes (e.g., the upper class or lower class), which inevitably affects their life conditions and self-images—i.e., people usually perceive themselves to be of a particular rank and thereby identify with a specific social class. Due to that, people of similar status meet similar fates and gather similar experiences, which is why these dispositions happen to be homogenous for members of the same social class, constituting a class habitus. Based on this reasoning, we hypothesise that the policy stance of heads of government reflects the habitus of the social class in which they were socialised. Our empirical evidence suggests that low-status individuals are more inclined to support public debt incurrence. There are two explanations for this state of affairs. First, attitudes toward public indebtedness depend on the individual’s personal economic situation: people are less reluctant to live at the expense of future generations if they are relatively worse off. Second, the propensity toward public debt incurrence is likely affected by persons’ degree of future orientation, as running a public deficit can also serve as a way to enjoy welfare gains from public goods and services and postpone the burden associated with rising tax rates or cuts in government spending for the future. Status, in turn, is found to be inversely related to a person’s orientation toward the future as well as the willingness to delay gratification. Can we trust these findings? In a related study (Hayo and Neumeier, 2014), we employ a similar theoretical and empirical framework but utilise observations on the German states (Länder) and their prime ministers. In contrast to the OECD countries, in this sample of states within a federation, there is a much greater degree of homogeneity across the various cross-sectional units. But again, we find robust evidence for the influence of leader’s social status in line with the results reported for OECD countries above. Finally, a political leader’s socioeconomic status may not only affect her propensity to rely on deficit financing. In Hayo and Neumeier (2012), we show that the status of heads of governments also exerts an influence on the size and composition of public spending. Our findings suggest that political leaders who were socialised in the lower class conduct policies that support a levelling of status-related social inequalities. This implies increasing expenditure on budget components such as social security, education, and health care, which are prominent dimensions of social deprivation. This result is consistent with the notion that individual behaviour exhibits a social rivalry motive, implying that members of the upper class seek distinction from low ranks in order to enhance and secure their privileged and prestigious position, whereas people of low status strive for status advancement and a levelling of status-related differences between classes. Hayo, B. and Neumeier, F. (2012), Leaders’ Impact on Public Spending Priorities: The Case of the German Laender, Kyklos 65, 480‒511. Hayo, B. and Neumeier, F. (2014), Political Leaders’ Socioeconomic Background and Fiscal Performance in Germany, European Journal of Political Economy 34, 184‒205. Hayo, B. and Neumeier, F., Political Leaders’ Socioeconomic Background and Public Budget Deficits: Evidence from OECD Countries, forthcoming in: Economics & Politics. This entry was posted in Comparative politics and tagged budget deficits, political leaders, presidents, prime ministers, traits on March 9, 2016 by Robert Elgie. Marina Costa Lobo, Robert Elgie, and Gianluca Passarelli – Are Europe’s presidents really perilous? In a recent EUROPP blog post Macdara Dwyer argued that presidential interventions could “generate lasting problems for the stability of European governments”. We take issue with the central themes of that post. We argue that European presidents do not tend to be very powerful, that recent presidential interventions in countries like Greece, Ireland, Italy and Portugal need to be placed in their proper context, and that European presidents are an essential part of a broader system of checks and balances. Overall, we disagree strongly with the idea that recent presidential interventions are “highly alarming”. About two-thirds of all countries in the world have a president. In many of these countries, presidents exercise truly extensive powers. They include most of Latin America, Africa, Central Asia and the Caucasus, as well as parts of Asia, such as Indonesia, the Philippines, and South Korea. By contrast, in the 28 member states of the EU only three countries usually have a strong president – Cyprus, France, and Romania. On the contrary, many European countries have very weak indirectly presidents who do not enjoy reserve or inherent powers even in theory. Indeed, most directly elected presidents in the EU are very weak political actors. The popularly elected presidents of Slovenia and Croatia do not even have the power to send a bill back to parliament or to a constitutional court. In short, we need to place the power of European presidents in comparative perspective. For sure, even Europe’s indirectly elected presidents usually have at least some prerogatives, but compared with their counterparts elsewhere, they are truly little more than figureheads and that includes most of Europe’s directly elected presidents. Maybe though, presidential power in Europe is on the rise. The evidence from Portugal in the early 1980s, Poland in the mid-1990s, and Finland since the early 1990s suggests otherwise. Here, constitutional amendments have weakened the power of the president to the extent that, for example, Finland now has one of the very weakest presidents in Europe. Even in France certain presidential powers have been constitutionally limited. In other countries too, presidential power has been streamlined even if the constitution has not been formally amended. For example, in Finland the president no longer has any serious power to intervene in the country’s EU negotiations. It is true, though, that the exercise of presidential power is contingent. Events do encourage presidents to intervene and there is no doubt that we are living through difficult times. So, is there now more presidential intervention than there was previously? Hardly. The current President of Ireland, Michael D. Higgins, has indeed been a critic of austerity policies in general, though not specific government policies in particular. However, those with a longer memory will recall President Cearbhall Ó Dálaigh’s decision to refer a bill to the Supreme Court in 1976 and Mary Robinson’s handshake with Gerry Adams in 1993. These examples show that events can conspire to make the Irish president act consequentially and in ways that make President Higgins’ recent interventions seem very minor. In Portugal, the President can be an effective actor in some circumstances, by way of the power to veto legislation, the ability to refer bills to the Constitutional Court, as well as powers to dissolve parliament. Yet the President is never the head of government, nor can the President nominate the Prime Minister against parliament’s will. In this context, President Cavaco Silva cannot be said to have been more interventionist or powerful than his predecessors. Since the bailout started in 2011, he has used his powers to veto or refer legislation to the Constitutional Court much less than his predecessors. Furthermore, given that the Portuguese President cannot dissolve parliament in the last six months of the presidential mandate and Cavaco Silva’s term ends in January 2016, his powers have actually been diminished in these last few months. In addition, with regard to the recent process of government formation in Portugal, there were no “winning parties running on a combined ticket promising coalition”. The anti-austerity left coalition was only negotiated after the election, does not involve a common agreement, and did not lead to a coalition government – only a Socialist minority cabinet with support from the radical left in parliament. But maybe any presidential intervention is fundamentally worrying. There is certainly evidence that high levels of presidential power are problematic. Belarus, Europe’s last dictatorship, is founded on an all-powerful presidency. There is also some evidence that dual executives can be problematic especially for young democracies. In 1993 Niger’s first democratic experiment collapsed during a period of cohabitation between the president and prime minister. But EU member states do not have all-powerful Belarus-style presidents and they are not Niger-style young and fragile democracies. They can surely withstand presidential interventions of the sort we have seen recently. More than that, we should think of presidents as being part of a broader democratic system of checks and balances. Both indirectly elected and weak directly elected presidents have the potential to offer a counterpoint to majority governments. These presidents all have the legitimacy – including those elected by the representatives of the people in parliaments – to ask difficult questions, to request that bills be reconsidered, to confirm the constitutionality of bills, even to interpret the specific wording of the constitution, and so on. Inevitably, some presidential interventions will displease some people. That’s politics. But in the constitutional framework of EU member states presidential interventions are scarcely “alarming” or likely to generate “lasting problems”. In fact, presidents can offer a check that monarchs cannot, precisely because the latter have absolutely no legitimacy to act in contemporary democratic systems. Overall, rather than trying to muzzle presidents, we would encourage them to speak out even more at least within the constitutional limits in which they currently operate. Marina Costa Lobo (marina.costalobo@ics.ulisboa.pt) is Principal researcher at the Institute of Social Sciences at the University of Lisbon. Her research interests include the role of leaders in electoral behavior, political parties and institutions. Her latest book was co-edited with John Curtice and is entitled: Personality Politics: the role of leaders in democratic elections, Oxford: Oxford University Press, 2015. She has published articles in Electoral Studies, European Journal of Political Research, and Political Research Quarterly among other journals. For more information see www.marinacostalobo.pt. Robert Elgie (robert.elgie@dcu.ie) is Paddy Moriarty Professor of Government and International Studies at Dublin City University. He is the general manager/editor of the Presidential Power blog (www.presidential-power.com). He has published numerous books, including Semi-Presidentialism: Sub-types and Democratic Performance (Oxford University Press, 2011). He has published in journals such as Comparative Political Studies, British Journal of Political Science, Political Research Quarterly, and Journal of Democracy. He is the editor of the journal French Politics. His most recent book is Studying Political Leadership: Foundations and Contending Accounts, (Palgrave Macmillan, 2015). This entry was posted in Comparative politics, Europe and tagged Europe, presidents on January 5, 2016 by Robert Elgie. Although events in Argentina have grabbed international headlines and in Venezuela, the president of the Assembly (and one of his bodyguards) have become embroiled in allegations about a narco-trafficking ring, I have decided to return to something I discussed last year (and once again engage in some self-promotion – sorry). As I told you in that post, with two colleagues, Christian Arnold and Nina Wiesehomeier, I have been working on a project that is using the annual addresses of Latin American presidents as data in order to derive some comparative understanding of executive politics across the region. Every year, Latin American presidents make a speech to the national assembly (akin to the US State-of-the-Address). This is an institutionalized event, where the president is constitutionally obliged to make this speech at an appointed time each year and report on the initiatives of the executive over the last year, and the proposed agenda for the year ahead. We have been interested in who the president is primarily speaking to when they make these speeches, and we suggest there are two audiences: the legislature and the international economy. We have collected speeches for 68 presidents across thirteen Latin American countries between the years 1980 and 2014 and have employed computational models, based on the scaling algorithm Wordfish, to scale these speeches (relative to each other within each country). The first part our project was interested in the institutional incentives the president may have to move in the policy space, and our research has indicated that this seems to be largely driven by the legislative support of the president and their executive power. Right now, we have been exploring the effect of international market pressures on the positions that presidents take. Latin American countries face significant pressures from international capital, be it in the form of the IMF, banks or bonds and presidents have switched their policy orientation in response to exchange market crises. We are interested in the effect that international capital has on the behavior of the president. Specifically, does the president change their revealed policy stance on economic policy in response to the preferences of capital? And if so, what effect does this have? To explore this, we have developed an automated method of extracting the portion of the speech where the president discusses all matters related to the economy. We then re-scale this economic dimension only, with the method I briefly described above. This gives us a reasonable approximation of the economic policy position of each Latin American president (in our thirteen countries) in a given year. Below, you can see two graphs combining the general overall position of presidents, and their economic position, in two different countries. Unsurprisingly, in Venezuela, the economic position is closely related to the overall position. This is what we might expect, given the main political cleavage in Venezuela at the moment probably runs along an economic (redistributive/statist vs. market) dimension. In Colombia, the economic position is less important for the overall position of presidents. Again, this is what we might expect, given the importance of security-related issues for politics in Colombia. With these measures, we have done some basic analyses to see what shapes the economic positions that presidents assume. Unsurprisingly, presidents in Latin America are highly responsive to international capital. When under IMF programs, presidents assume a position on the right. The higher the level of bank or bond debt, the further right the political position (although this effect is greater for bank debt). And when there is a currency crisis, presidents move to the right, and do so sharply. We interpret all of this as a signaling game, whereby presidents will adopt economic positions favorable to capital when they are in desperate need of short-term inflows of finance (crises); or when they believe doing so might create some space (from banks and the IMF) to pursue policies more amenable to their electorate. Of course, all of this is all very tentative. Any thoughts or suggestions would be very welcome! Some excellent recent research has explored this. See Stephen B. Kaplan 2013. Globalization and Austerity Politics in Latin America. Cambridge University Press or Daniela Campello 2015. The Politics of Market Discipline in Latin America: Globalization and Democracy. Cambridge University Press or Erik Wibbels. 2006. “Dependency Revisited: International Markets, Business Cycles and Social Spending in the Developing World,” International Organization (Spring 2006): 433-69. This entry was posted in Latin America and tagged economic policy, presidents, Speeches, State of the union on January 29, 2015 by David Doyle. The premature termination of a presidential term – be it by impeachment, resignation or death of the incumbent – is generally a rare phenomenon so that the respective regulations belong the constitutional provisions that are applied least often in political practice. Nevertheless, in recent years a number of European republics had to activate these stipulations, often for the first time. This post compares the regulations on acting presidents in European republics and discusses the consequences for the separation of powers and potential for conflict. The resignations of German Federal Presidents Horst Köhler in 2010 and Christian Wulff in 2012 presented the first instances in which speakers of the Bundesrat had to take over presidential duties. Similarly, the tragic death of Polish President Lech Kaczyński in 2010 was the first event in post-1989 Poland that required the Sejm Marshal (speaker of the lower house) to temporarily fulfil the role of president. In Romania, the two impeachment attempts against president Traian Basescu in 2007 and 2012 also meant that the speaker of the Senate acted as president while the population was consulted in referenda. On the other hand, when Slovak president Schuster needed to receive specialist treatment in an Austrian hospital in 2000, the speaker of parliament and Prime Minister fulfilled his duties in tandem. The above examples show that European republics show a great variation in who becomes acting president. In fact, Bulgaria and Switzerland are the only European republics with a functioning vice-presidency (although due to the collegial nature of the Swiss executive its position/relevance differs significantly)  and In the remaining countries it is not always obvious who takes over presidential duties in the case of presidential impeachment, resignation or death. The default option is to temporarily devolve the function to a representative of parliament (in all but Bulgaria, Finland and Switzerland representatives of parliament are involved), yet even here differences exist that have consequences for the division of power. In France, Germany, Italy and Romania the speaker of the second chamber of parliament. As – except for Italy – the government is not responsible to the second chamber this arrangement guarantees a mutual independence of acting president and other institutions. Even though Austria and Poland also have bicameral system, presidential duties here are performed by the speakers of the first chamber and thus by politicians that are more prominent in everyday politics and usually belong to the governing party. In Austria this is partly mitigated by the fact that the speaker and the two deputy speakers perform this role together, yet in Poland the stipulation proved to be controversial – not only because the generally more political role of the Polish Sejm Marshal but also because of the fact that acting president Komorowski was the government’s candidate in the presidential elections. In the Czech Republic, likewise a bicameral system, presidential duties are also fulfilled by the speaker of the first chamber, yet in cooperation with the Prime Minister. Countries with unicameral systems cannot generally choose a more independent political candidate, yet as the examples of Iceland and Ireland show it is still possible to create less political alternative by pairing them (among others) with the Chairman of the Supreme Court in multi-member committees that jointly fulfil the position of acting president. Estonia shows another way of ensuring independence of the speaker of parliament as acting president in a unicameral system. The constitution foresees that speaker of parliament temporarily gives up their function to act as president and a new speaker is elected for that period to maintain a clear separation of powers. Last, only Finland and Malta place the role of acting president in the hands of the Prime Minister which is even more exceptional when considering the great differences between the two political systems. The comparison above has shown that variations in who becomes acting president do not vary according to the mode of presidential election or presidential powers and their origin often predate the current political system. An example for this are the regulations in the Czech Republic and Slovakia which both based their regulations on constitutional drafts that still were still designed for the countries’ functioning within a federal Czechoslovakia. Once the break-up was agreed and quick adoption of new constitutions was needed, the presidency was merely added and the actors that previously represented the republic at federation level became the designated acting presidents (Slovakia only introduced a co-role for the speaker of parliament in 1998 as it turned out that the constitution did not transfer enough power to the Prime Minister as acting president to maintain a functioning state after parliament failed to elect a new president). The question of who is in charge when the president is gone might appear relatively insignificant at first glance given the rarity of early terminations of presidential terms or long-term absence of presidents during their term. Nevertheless, the different stipulations strongly affect the degree to which the presidency can or is likely to still fulfil its function as check-and-balance on other institutions while it is vacant. While this becomes more relevant the longer there is a vacancy in the presidential office, it still changes the balance of power within a political system already in the short term and therefore merits attention. For instance, during the one month that Slovak president Rudolf Schuster spent in hospital in Austria in 2000, Prime Minister Dzurinda and National Council speaker used their position as acting presidents to veto three bills to which Schuster had previously declared his opposition. Only shortly afterwards, the government majority passed the bills again and thus made sure that Schuster could no longer veto the bills or request a review before the constitutional court. The Cypriot constitution also institutes a vice-presidency which is reserved for a Turkish Cypriot while the post of president is to be held by a Greek Cypriot. Initially a Turkish Cypriot vice-president served alongside a Greek Cypriot president, yet the vice-presidency has been vacant for about 50-40 years. The start date of the vacancy is difficult to establish – while Turkish Cypriots have not participated in government or parliament since the 1963 crisis, the title of vice-president appears to have been used by Turkish Cypriot leaders until the coup d’état in 1974. Estonian members of government are also required to give up their place in parliament upon appointment and another MP enters parliament in their place for the time of their appointment. This entry was posted in Austria, Bulgaria, Croatia, Czech Republic, Estonia, Europe, France, Germany, Hungary, Latvia, Lithuania, Malta, Poland, Romania, Slovakia, Slovenia and tagged acting president, Christian Wulff, Europe, Horst Köhler, presidents, Rudolf Schuster, speaker of parliament on June 27, 2014 by Philipp Köker.